When shopping for a moving company in Fort McMurray or Edmonton, Alberta, you won't find a more professional and courteous mover. Locally owned and Operated, We are licensed, bonded, and insured. 4 Seasons Moving and Transportation specializes in local and long distance moving. We have a wide range of services that we are able to offer not just to our residential clients but our corporate ones as well. Our services range from customized packing, relocation, storage to flat deck services, junk removal and even printer moves. Originating in 2012, 4 Seasons Moving accredits business longevity to providing every customer with quality service on every move which has enabled us to consistently provide excellent customer service and lets us maintain a relationship of trust with the people who have come to rely on us for their moving needs. Rather than relying on extensive advertising, much of our business comes from repeat and referrals from our many satisfied customers. FMM Oil companies, their customers, local Fort McMurrray or Edmonton businesses, property management, Realtors, Builders, Small/Medium/Large Businesses, and Senior Communities trust us to enhance the services that they make available to their clients and residents, and we always look forward to providing their clients, and clients’ possessions, with the “Best Care in the Business”. We hope that you’ll give us the opportunity to show you the difference of moving with 4 Seasons Moving! 4 Seasons Moving's excellence speaks for itself. Our clients sure seem to agree. Here is a sample of the reviews and feedback we get from our satisfied clients. Hany and his crew did a great job for me this week. It was a long distance move on a short notice. Upon reaching the destination they unpacked everything and assembled all furnitures.. Great job guys. Highly recommend ! Amazing prices and amazing customer service. Truly go above and beyond. I was in a bind last minute and they worked with me to get my stuff moved from Vancouver Island to Alberta quickly, within my budget, and without me even being there. These guys are awesome! please feel free to contact us at anytime by filling out the contact form at the bottom of the page. What provinces do you travel to for long distance? How do I get started for a long distance move? How do you protect my furniture while in transit? What should I keep with me on my moving day? How do I figure out how many moving boxes I need? What is the best size box for moving? We cover all of Alberta, Saskatchewan, and British Columbia currently for our long distance trips. Most moving companies will require a deposit payable by cash, credit card or E-transfer when booking your move date. Tariff provisions require that all charges must be paid prior to your shipment being unloaded at destination. Payments upon delivery can be made using cash, money order (COD), E-transfer or credit card. If your employer is paying for the move, your employer may pre-arrange to be billed via invoice. Be sure to have this all worked out prior to your packing and loading day. Typically the first step is to arrange for a free, in-house estimate with one of our trained estimators. The rule of thumb is "the sooner the better," while we're a well-established company sometimes we do book up. We recommend that you get your estimate 30 days before your planned move date. Certainly, plus you can get boxes and professional packing materials from us at very competitive prices. Packing is charged on a flat rate price as to save you money. Our packing service is flexible; you can hire us to pack everything, certain things or nothing. Furniture is wrapped in soft, thick furniture pads before it's loaded. Upholstery is covered with plastic covers before being pad-wrapped. 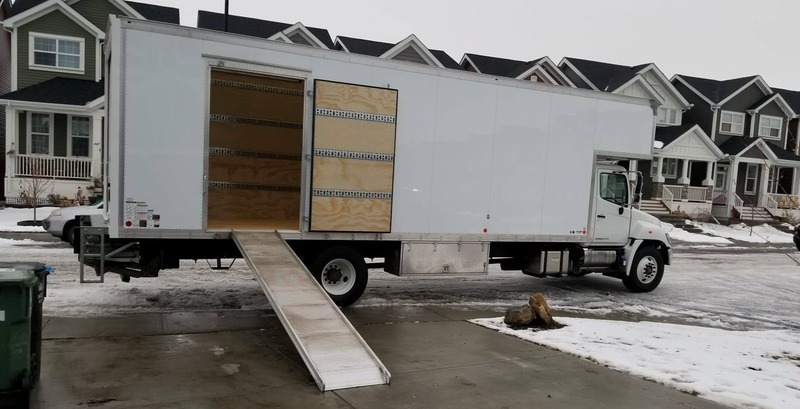 Our trucks and trailers come equipped with clean furniture pads, rubber four-wheel dollies, appliance hand trucks and sufficient logistic straps which are used to secure the load while in transit. Our movers are trained on the proper manner to pad-wrap furniture along with the correct way to load the shipment into the trucks. Keep with you anything you or your family will use on the day of your move with you. Common items include snacks, toilet paper, paper towel, phone chargers, a change of clothes, toothbrush/toothpaste, and your kids’ favorite toys. Additionally, medications, important paperwork (e.g., birth certificates and social security cards), and anything highly valuable or sentimental (jewelry, credit cards, bank account information, etc.) should be set aside. On your moving day, place these essential items in a box or bag that you’ll carry with you to your new home. Determine the square footage of your house. Based on the square footage, you can estimate how many boxes you’ll need. Less than 500 sq ft: 3 – 12 large boxes, 8 – 15 medium boxes, 12 – 18 small boxes, 2 – 5 dish barrels, and 3 – 5 wardrobe boxes. Between 500 – 999 sq ft: 5 – 15 large boxes, 10 – 20 medium boxes, 15 – 25 small boxes, 3 – 6 dish barrels, 3 – 6 wardrobe boxes. Between 1,000 – 1,499 sq ft: 10 - 20 large boxes, 15 - 25 medium boxes, 20 - 30 small boxes, 4 – 6 dish barrels, 5 – 7 wardrobe boxes. Between 1,500 – 1,999 sq ft: 15 – 25 large boxes, 20 - 30 medium boxes, 30 - 40 small boxes, 5 – 97 dish barrels, 5 – 10 wardrobe boxes. More than 2,000 sq ft: 20 – 30 large boxes, 25 - 35 medium boxes, 40 - 50 small boxes, 6 – 9 dish barrels, 8 – 12 wardrobe boxes. Small box (1.5 ft3): best for heavy items such as books, canned goods, shoes, etc. Medium box (3 ft3): best for items without a uniform shape such as lamps, lamp shades, or small kitchen appliances. Large box (4.5 ft3) and extra-large box (6 ft3): best for light items like pillows and bedding. Picture box: best for framed artwork, mirrors, and other thin items that are fragile and breakable. Dish barrel and dish pack inserts: best for packing dishes and other fragile kitchen items. Wardrobe box: best for clothes on hangers.